(A) Two immiscible liquids (phases A and B) that are not emulsified. (B) An emulsion of Phase B dispersed in Phase A. (C) The unstable emulsion progressively separates. (D) The surfactant (purple outline) positions itself on the interfaces between Phase A and Phase B, stabilizing the emulsion. An emulsion is a mixture of two immiscible (unblendable) substances. One substance, called the "dispersed phase," is dispersed in the other, known as the "continuous phase." Examples of emulsions include butter, margarine, espresso, mayonnaise, the photosensitive side of photographic film, and cutting fluid for metalworking. The process of preparing emulsions is called emulsification. Emulsions are part of a more general class of two-phase systems of matter called colloids. Although the terms colloid and emulsion are sometimes used interchangeably, the word emulsion tends to imply that the dispersed and continuous phases are both liquids. In the case of butter and margarine, a continuous lipid phase surrounds droplets of water—they are examples of "water-in-oil" emulsions. Mayonnaise is an "oil-in-water" emulsion stabilized with lecithin obtained from egg yolk. A substance that stabilizes an emulsion is called an emulsifier, emulgent, or surfactant. Detergents are a common group of surfactants. In addition, various emulsifiers are used to prepare facial creams and skin lotions. Emulsions tend to have a cloudy appearance, as a result of the scattering of light. As light passes through the emulsion, it is scattered by the many interfaces (boundaries) between the different phases (such as water and oil). In addition, emulsions are unstable and do not form spontaneously. An example of an unstable emulsion is homemade salad dressing made by mixing oil and vinegar. The two phases separate quickly unless shaken repeatedly. The phases separate when smaller droplets recombine to form larger ones—a phenomenon called "coalescence." Fluid emulsions may also suffer from creaming—the migration of one of the substances to the top of the emulsion under the influence of buoyancy or centripetal force when a centrifuge is used. To form an emulsion, the mixture of substances needs energy input through processes such as shaking, stirring, spraying, or homogenizing. As noted above, an emulsion can be stabilized by adding certain substances known as emulsifiers or surfactants (surface active agents). A good surfactant increases the kinetic stability of the emulsion so greatly that the emulsion, once formed, does not change significantly over years of storage. Breaking: The dispersed particles (droplets) coalesce and form a layer of liquid. Flocculation: The particles of the dispersed phase form clumps. Creaming: The particles of the dispersed phase concentrate near the surface of the mixture while staying separated. 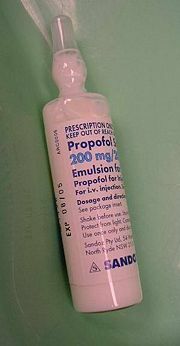 An ampule containing 20 milliliters of 1 percent propofol emulsion suitable for intravenous injection. Manufacturers emulsify the lipid-soluble propofol in a mixture of water, soy oil, and egg lecithin. Certain proteins, phospholipids, and low-molecular-weight substances can act as emulsifiers (or surfactants). Examples of food emulsifiers are egg yolk, in which the main emulsifying agent is the phospholipid lecithin, and mustard, in which a variety of chemicals in the mucilage surrounding the seed hull act as emulsifiers. Both mayonnaise and Hollandaise sauce are oil-in-water emulsions stabilized with egg yolk lecithin. Detergents are another class of surfactants. They chemically interact with both oil and water, thus stabilizing the interfaces between oil and water. This principle is exploited in soap to remove grease for the purpose of cleaning. A wide variety of emulsifiers are used in pharmacy to prepare emulsions such as creams and lotions. The production of a water-in-oil emulsion or an oil-in-water emulsion depends on the volume fraction of the two phases and the type of emulsifier. As a general rule, emulsifiers and emulsifying particles tend to promote dispersion of the phase in which they do not dissolve very well. This is called the "Bancroft rule." For example, certain proteins dissolve better in water than in oil, so they promote the dispersion of oil droplets throughout a continuous phase of water—that is, they promote the formation of oil-in-water emulsions. ↑ In this case, "kinetic stability" refers to stability of the movement of particles in the dispersed phase. Sjoblom, Johan. (editor), Emulsions and Emulsion Stability (second edition). Surfactant Science Series Vol. 61, CRC (2005). ISBN 0824726952. Sjoblom, Johan. (editor). Encyclopedic Handbook of Emulsion Technology, CRC, 2001. ISBN 0824704541. Becher, Paul. Emulsions: Theory and Practice (third edition). American Chemical Society, 2001. ISBN 0841234965. This page was last modified on 21 September 2013, at 17:18.